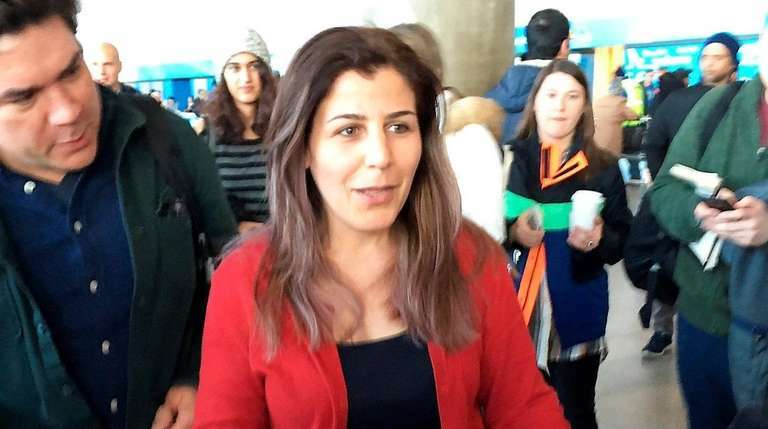 Vahideh Rasekhi, an Iranian sixth-year doctoral student in Stony Brook University’s linguistics department, and other detainees were released from Kennedy Airport Sunday after being held under a U.S. entry ban issued Friday by the White House. She was released at 2:30 p.m., saying “I’m exhausted” as she hugged and kissed her friends and attorneys at the airport’s Terminal 4. Rasekhi is pursuing a doctorate in linguistics and is president of the Graduate Student Organization, SBU spokeswoman Lauren Sheprow said. Her detainment, a result of President Donald Trump’s executive order banning entry of non-U.S. citizens from seven Muslim-majority countries, exceeded 24 hours, said Mehdi Namazi, a friend of Rasekhi’s. Outside Terminal 4, Rasekhi said she was “super scared” that she would eventually be deported. Federal officers asked her “regular, simple visa questions,” and she understood those who detained her “have to do their jobs,” Rasekhi said. About 10 of her friends gathered Sunday morning at Terminal 4 waiting for news about Rasekhi’s detention, Namazi said. “Everyone knows her,” Namazi said, adding that “she’s very famous” on campus. Rasekhi left for Iran to visit her family the day after Trump was elected president, her roommate Agatha Lyczek said. Lyczek, 29, of Port Jefferson Station, said the two spoke shortly after Rasekhi arrived in Iran, and her roommate told her she was “really scared” about being able to return. Another Stony Brook student named Sahar, 32, who declined to provide her last name, said she was waiting for her parents, who were detained coming to visit her after not seeing her for 3 1⁄2 years. They received their visas earlier this month. “I never expected to welcome them to the United States like this,” said Sahar, who has a student visa. Every hour or so, detainees left Terminal 4 and were greeted by relatives and attorneys, to the sound of thunderous applause. The Central Diner, a cafe in the terminal, became a hub for attorneys who volunteered to assist with the cases of detainees. “There’s a lot of energy and willingness to come forward and help,” said Camille Mackler, director of legal initiatives at the New York Immigration Coalition, who estimated that “hundreds” of attorneys came forward this weekend. Rep. Hakeem Jeffries (D-Brooklyn) said those attorneys ranged from law firm associates to partners. Selden resident Abdulelah Othman — a green card-carrying Yemeni citizen visiting his ailing mother in Saudi Arabia — remained there Sunday, his wife said. “It’s not looking promising,” Gundrum said in a telephone interview. Comments from White House Chief of Staff Reince Priebus on Sunday stating that holders of green cards are not subject to the ban “going forward” did little to ease Gundrum’s concerns. “I’m worried they will not allow him on a plane because he has a Yemen passport,” she said. The executive order bars people from Iraq, Syria, Iran, Libya, Somalia, Sudan and Yemen from entering the United States. “We thought because he had his green card he’d be safe — no one knew something like this was going to happen,” Gundrum said. 9 books to better understand Donald TrumpNine books to better understand the POTUS and his victory.